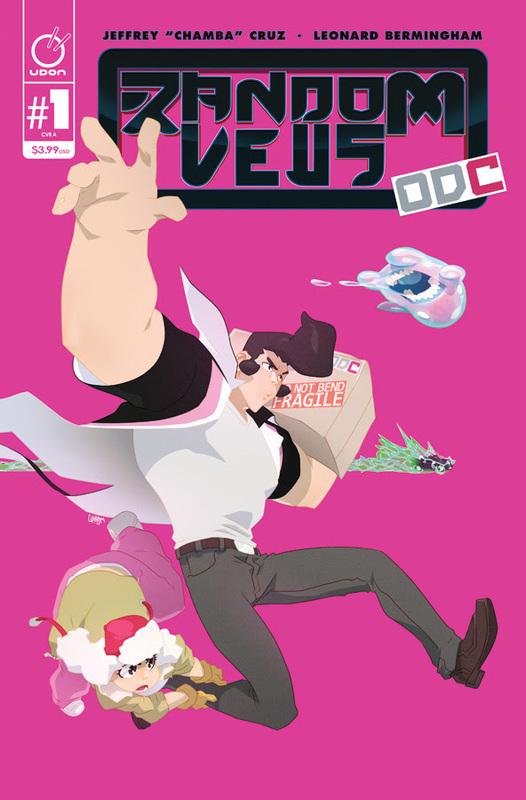 The UDON comic book publishers will release this January, RandomVeus: ODC, a five-issue new and original comic series from artist Jeffrey “Chamba” Cruz (Street Fighter II Turbo, Overwatch), and written by Leonard Bermingham. Chamba, an UDON MVP and respected artist who worked with everyone from Marvel and Disney to DC and Capcom, brings his infectious energy and imagination to the RandomVeus Veuniverse. One Dimensional Couriers (ODC), an interdimensional delivery service, must convey packages to every bizarre corner of the Veuniverse. Join bouffant-sporting Raimundo and his spunky sidekicks as they drive their demon-fueled convertible through flaming apes, ravenous sand-sharks, killer robot assassins and more! RandomVeus: ODC #1 will different covers by Chamba and Adam Warren (Empowered, Gen13, Dirty Pair). All will be available on sale this January 2019. For more on Udon, follow them on Twitter at @UdonEnt.